At the end of September I attended my first FantasyCon. For any writer or reader of the speculative genres it proved a long weekend of intellectual overload. Catch my post-Con thoughts HERE. 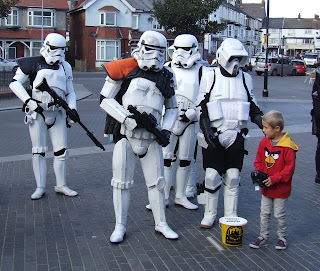 Still on a high, I went on to investigate Bridlington ComicCon – a first for both the town and me. Yes, there were comics, boxes and boxes of them on tables and tables, all wrapped in protective plastic and labelled as if rare artefacts, which I’m sure some were. Enough to whet the appetite of any collector. It was fascinating to watch illustrators and graphic artists bring to life 3-D worlds on 2-D paper with nothing more than a couple of Sharpies and a bucketful of talent. Cosplayers mingled as if in a surreal marketplace, complete with a patrol of Stormtroopers ex Star Wars telling us all to move along; nothing to see here... when there was plenty to see everywhere I turned. In for a penny... This weekend it was off to Hull HorrorFest. It wasn’t as busy by the time I arrived, though I didn’t venture upstairs to the movies being run with Q&As from their writer/directors. Doubtless ravenous hordes of decaying figures were lurking in the comforting darkness. If you wanted to feast on the delights of cupcakes topped with gore-oozing eyeballs, or slice up a celebration cake in the shape of a greenish severed forearm, this was definitely the place. There were zombies, though not as many as I’d expected. I have to admit, though, there is something unsettling about being urged to contribute to a hospital charity by a shuffling once-human medic in a tattered white coat, even when you know it’s all in the make-up and gait. 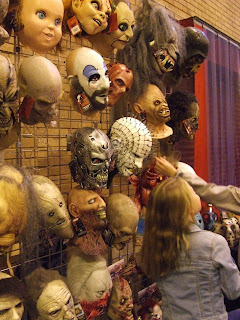 The biggest surprise was chatting with a member of MadAboutHorror.co.uk in front of its wall of head-masks and discovering that not only is it based close to where I live, but that the majority of its sales aren’t Halloween entertainment but to “collectors”. Er... collecting for what, exactly, neither of us wanted to discuss in depth, but a seed of a story started to fester before I’d even left the booth. At the turning of the year Hull becomes City of Culture 2017, and I came across a roaming monk carrying a hemp noose (as you do) and proffering leaflets for new venture Dark History Museum of Hull, part museum and part immersive attraction by the sound of it, due to open mid-year. I wish them well. There were green-screen selfies on offer, make-up artists offering their skills from quaint Dracula-for-children to the air-brushed full-body outfits of The Walking Dead, and people were signing up to be considered as extras in the forthcoming LARP film Xisle. The event, both events, were an interesting and cheap way to grab a few hours entertainment; but writers and books? A scattering of authors did attend, yet they certainly weren’t being mobbed. I guess it depends on the genre and the Con. That’s it for me until FantastiCon where I have an author table and am on a panel discussing writing. It won’t be so much graphics and make-up as NERF wars and VR gaming. And actors. And cosplayers. And lots of authors. See you in Hull’s Guildhall late November. When I saw the monk I thought of Savonarola and the Bonfire of the Vanities, but he would have had some faggots and a flaming torch! 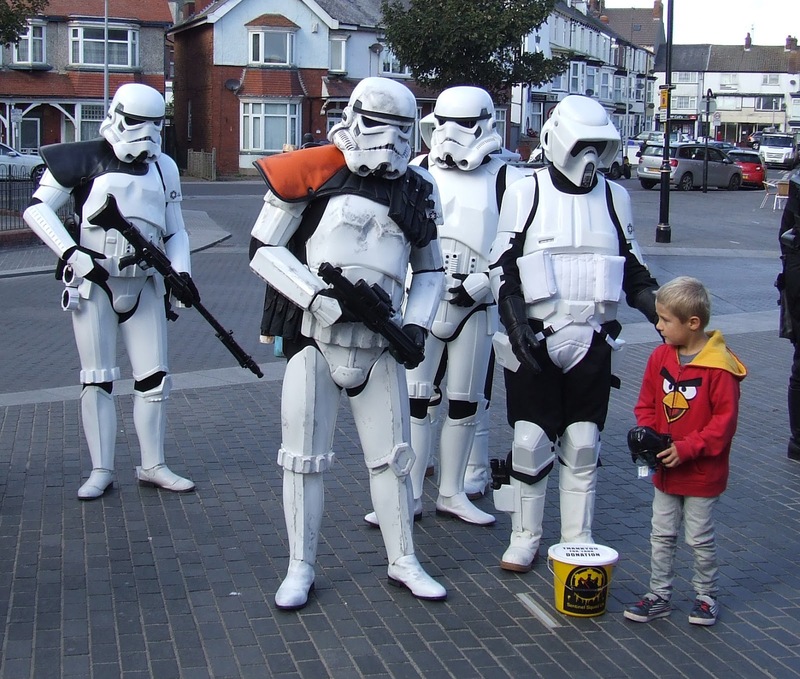 I love the inventiveness of the people who organise and participate in these conventions. Do they and the whole atmosphere of the events give you, as an author, motivation and plot/character ideas? FantasyCon certainly gave me motivation; the others definitely scenario ideas for fiction. I shall now be letting the experiences congeal, and the ideas compost. Sorry, *fester*. But it does prove that the most unlikely places/events offer situations to pique our creativity. It's all a matter of taking the time and allowing the mental space to step back for a moment, look about and consider the "what if..? ", be it when a zombie is intent on approaching or following someone in a supermarket queue. Halloween #BookTrailer for #Horror Short – Live! Should Writers Attend Conferences & Conventions?